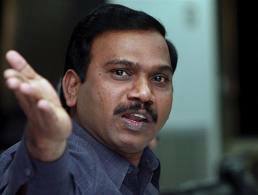 A Raja the Telecom Minister had made an effort to freeze the report of the national auditor on the 2G spectrum scam just days before the same was tabled in Parliament. The report, which accused Raja of flouting almost every rule in the book, ignoring advice from the prime minister down and indulging in blatant favouritism while awarding mobile licences to mostly undeserving companies causing a loss of nearly Rs1,77,000 crore to the government, was tabled in Parliament on November 16. Raja resigned on November 13 following the political storm after opposition parties and media had accessed the contents of Comptroller and Auditor General (CAG) final report even before it was tabled in Parliament. According to the reports on November 10 the telecom ministry had shot off a letter to the Prime Minister's Office stating that that the national auditor had no powers or duty to challenge policy decisions, while also adding that the law ministry had endorsed this position. Prior to all these in September, it sought to stonewall queries from the auditor of India's state-run institutions, using the same opinion from the law ministry that said policy decisions cannot be second-guessed by auditors. The department had then told CAG that it would not respond to further queries on the award of frequency spectrum to a new set of telecom operators in 2008 because these were policy decisions. The telecom department also told the Prime Minister's Office that it could not send detailed replies to queries raised by CAG since all files related to the 2G spectrum allocation had been confiscated by the Central Bureau of Investigation (CBI). DoT in this communication to the PMO also added that the national auditor had questioned the validity of many of the mobile permits issued by Raja in 2008. It also told the PMO that if it was established that the information furnished by the applications were incorrect, the government had the power to cancel the licences. The auditor said that these six companies had disclosed 'incomplete information and submitted fictitious documents and used fraudulent means' for obtaining them.